Let’s face it, a slot based on moths doesn’t sound very appealing at all, but don’t rush off just yet as Lunaris takes you on a magical journey through the woodlands late at night where Lunaris moths fly out from their stunning surroundings towards the brightness of the moon and you you’ll be enjoying high flying wins! Lunaris means crescent-shaped in Latin and due to their shape this is why Lunaris moths are named as they are. They appear beautifully with their wings spread and are notorious for being nocturnal and feeding on under the bark of trees and fungi, with an attraction to light that they just can’t resist. You’ll see a swarm of the stunning Lunaris moths fly across the Colossal Reels setup (just like the Spartacus Gladiator of Rome slot machine and the KISS slot machine) meaning there is a 5x4 main set of reels with the Colossal Reels containing a 5x12 structure. This means that there are 100 paylines but don’t worry because these moths won’t eat a hole in your wallet as you can bet per two paylines for stakes as little as 50p up to a maximum of £250 per spin. You’re in for a treat as you walk through the magical forest at dusk while the moon shines brightly attracting a swarm of Lunaris moths, but there is so many more breath taking sights to capture along your journey. A lunar clock face is the Wild symbol which has the ability to substitute for all other symbols aside from the Mystery and Bonus symbol, however when it transfers over to the Colossal Reel set it will never appear on the first reel. The Mystery symbol and the Reveal symbols look quite similar with the Lunaris moth pictured at different angles, while a beautiful green caterpillar is the Bonus symbol. You’ll also see a telescope that you can look through to take in the incredible views of constellations in the darkness of the sky, smell the beautiful fragrance of white and pink flowers that are dotted all around the forest, plus there are playing card suit symbols of club, spade, heart and diamond which have the smallest values of all. The most eye catching experience of the Lunaris slot machine is the Mystery feature. The mystery symbol is the green Lunaris moth and whenever it graces you with its presence on the first, third or fifth reels of the main reel set you’ll see a number accompany them. This number can be as large as twenty and whatever value it is, that number of moths will then swarm across to the Colossal Reel set where random symbols will be transformed into a designated symbol to create more winning combinations – and the more moths there are always means bigger wins! As slow as caterpillars are, it’s well worth being patient as when three or more of them slither on screen across both sets of reels (remember these can only appear on the first, third and fifth reels of both sets) you will be claiming an instant Scatter win along with a bunch of free spins, with the number of free spins that you receive correlating to the number of caterpillars you encounter. The Mystery symbols feature remains active throughout the free spins mode which never fails to result in delightful wins, and you’ll be pleased to hear that you can trigger additional free spins too! 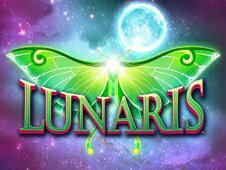 While the Lunaris moth is quite an odd theme for an online slot machine, WMS have worked their magic to take you on a stunning adventure through a mystical forest late at night when the green moths come out in attraction to the brightness of the moon – with you enjoying sky high wins for each that you encounter! It’s soothing soundtrack will remind you of that used in the Sea of Tranquility slot machine but with Colossal Reels, a Mystery feature, and a free spins feature to enjoy this is an adventure you’ll find yourself taking over and over again.